Hyderabad, India, 06 July 2012 : HOPE has become reality for 25,000 farmers in dryland Marathwada and Western Maharashtra regions of the state of Maharashtra, known as the ‘Sorghum Bowl of India’. Initial assessments indicate that their grain yields rose by 40% and fodder yields by 20% on average over the past three seasons (2010-2012) due to improved sorghum varieties and crop management practices, along with improved market linkages. About half of these farmers operate on a very small scale, with landholding size of two hectares or less.Net income (the income that farmers retain after their costs of cultivation are paid for) has increased by 50%, to an average of US$78 per hectare of sorghum grown. HOPE stands for ‘Harnessing Opportunities for Productivity Enhancement of Sorghum and Millets in sub-Saharan Africa and South Asia’, a project supported by the Bill and Melinda Gates Foundation. HOPE is led by the International Crops Research Institute for the Semi-Arid Tropics (ICRISAT) in close partnership with several state and national institutions on sorghum in India: Marathwada State Agricultural University, Mahatma PhuleKrishi Vidyapeeth State Agricultural University (MPKV), and the National Directorate of Sorghum Research. HOPE focuses its efforts in six target areas in the Sorghum Bowl that contain especially large areas of post-rainy-season sorghum. About one-third of the targeted area is now sown to improved varieties, compared to just 10% before HOPE began its work. In a recent project planning meeting, Dr TA More, Vice-Chancellor of MPKV praised the results to date from HOPE, and stressed the need for a Green Revolution through major improvements like these in rainfed crops. The cropping system in the Sorghum Bowl is unique. Instead of growing the crop in the warm summer rainy season it is sown after the rains end in September/October, and harvested in January/February. Farmers plant the crop on heavy clay soils that retain large amounts of the season’s excess rainwater; the sorghum roots then extract that water to support plant growth. The new varieties have been especially taken up by the poorest farmers because they depend the most on rainfed cropping, being least able to afford irrigation water. The sorghum varieties that are delivering these impressive gains were developed by Indian institutions by improving the traditional ‘Maldandi’ type of varieties cultivated in this area. These new varieties are well adapted to the cold temperatures and short daylength of the winter months, and are tolerant or resistant to drought and to the pests and diseases prevalent during this season such as aphids, shoot fly and charcoal rot. Varieties are currently being developed that will yield larger, brighter grains to attract higher market prices. They derive from crosses made at ICRISAT between the Maldandi types and ‘durra’ sorghum types from East Africa. Hybrid varieties also under development are expected to raise yield by another 20-30 percent. Dr William Dar, Director General of ICRISAT, explained that "Our international role is to encourage South-South sharing of promising technologies such as the durra sorghums of Africa, and the hybrid sorghum technology of India. The benefits flow both ways." Farmers typically keep about two-thirds of the sorghum crop for home use, and sell the rest. Farmers prize both the grains and the stalks of sorghum. The grains are for human consumption, while the stalks are fed to cattle. The two portions of the crop are about equal in economic value. Small-scale farmers typically own two to three cattle that they depend on to produce milk and to pull plows and cartloads. Sorghum stalks are fed to livestock; when used in this way the stalks are referred to as ‘fodder’. Growing demand for fodder to feed dairy cattle is expected for years to come, because Indians are consuming more dairy products as their incomes rise. Demand for fodder is especially strong in the parched northern states of Gujarat and Rajasthan, but those areas lack sufficient rainfall to grow enough fodder. The demand for grain will also increase, but less rapidly. India’s National Food Security Mission recently announced that it will buy and distribute sorghum grain to India’s poor, expanding market opportunities for farmers. To better access grain markets, HOPE is helping farmers improve the cleaning, grading and packing of grain, and connecting them to sources of up-to-date information on market prices and demand volumes. For more information about ICRISAT, please visit www.icrisat.org. ICRISAT is a member of the CGIAR Consortium www.cgiar.org. 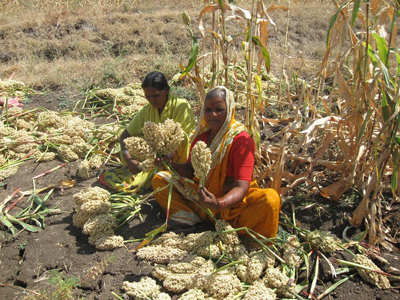 Sorghum farmers in Maharashtra collect larger panicles for use as seed the following year. For media enquiries, contact: Showkat Nabi Rather, Media Liaison Officer, +91 40 3071 3187, R(dot)Showkat(at)cgiar(dot)org.